Just two problems: Conservatives hate it. And liberals hate it. 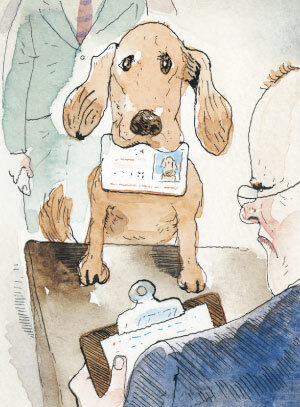 Illustration: Barry BlittI’ve long believed that there’s a keen irony in the never-ending battle over voter ID. There’s an easy solution available to us already, one that should satisfy both sides, but in fact satisfies neither. Republicans hate it, Democrats hate it, and libertarians hate it. Everyone hates it. That sounds scary. But step back for a moment and listen to Anantharaman Muralidharan, a native of Singapore writing a few months ago about the identification card required of all residents there. It “doubles as a library card, it serves as identification when I apply for overseas visas or want to open a bank account. Someone’s IC also allows me to identify the other party if I get into an accident.” Hear any SS overtones? I don’t. The reality of national ID is really pretty simple: It’s just a way of identifying people. It’s not a way of stopping terrorism. It’s not a way of stopping identity theft. (The critics are right about that.) But it would be a way for employers to make sure they hire only legal residents. It would be handy for the poor and the unbanked who don’t have ready access to secure ID. It might even make emergency medicine easier if it allowed more reliable access to digital medical records. But its greatest advantage might come at the ballot box. With a national ID card, voter registration—whose only purpose is to ensure that you’re eligible to vote—is a thing of the past. Just show your ID, which confirms that you’re 18 and a citizen, and you get to vote. If you’ve moved, all you need is your ID along with evidence of your new address. If states want to prevent, say, felons from voting, it’s up to them to make lists of ineligible voters for poll workers. But the burden is on them. In a functioning national ID system, the government should go out of its way to make ID easy to get. At a designated age—maybe 16, maybe 18—you get your card. If you have trouble with your birth documentation, the government helps you. If you lose your card, it gets replaced. Cards are available at every post office and every federal building. Live in a small town that has neither? No problem—roving ID-mobiles roll through each village and hamlet once every month or two. Who would do all this? The Commerce Department doesn’t really have much of a mission anymore. This would give them one. If not Commerce, maybe State or Treasury. Instead, we’re barreling headlong toward the worst of all possible worlds: a system with all the downsides and none of the upsides of true national ID. The 2005 Real ID Act requires all 50 states to tweak their driver’s licenses to meet federal standards on things like machine readability. The states hate it, implementation has been postponed three times, and when (or if) it’s all said and done we’ll still have 50 different cards managed by 50 different bureaucracies. What’s the point? If we’re going to do this, we’re better off doing it right. National ID can be simple, convenient, and free. And it would make cries of voter fraud a thing of the past.